Claude Lorrain (1604/5–1682), Capriccio with Ruins of the Roman Forum (c 1634), oil on canvas, 79.7 x 118.8 cm, Art Gallery of South Australia, Adelaide, South Australia. Wikimedia Commons. In 1611, Agostino Tassi, who had been a pupil of Paul Bril in Rome, was working with Orazio Gentileschi, painting frescoes in the Palazzo Pallavicini-Rospigliosi in Rome. Orazio had a daughter, Artemisia, who was then just eighteen and desperate to be an artist like her father. Orazio agreed to pay Tassi to provide his daughter with private teaching in art. The circumstances and evidence have been examined and re-examined many times since Tassi’s trial, and there remain extensive papers and documents which have been used to support various arguments about the rights and wrongs of the situation. It is important to bear in mind that, at that time, consent was considered less important than previous virginity, and expectations of marriage. It emerged during the trial that Tassi was not only a man whose word could not be trusted, but that he had planned to steal some of Orazio’s paintings (and may already have stolen one), that he intended to murder his wife, and had engaged in an incestuous and adulterous relationship with his sister-in-law. Artemisia Gentileschi (1593–1653), Judith Beheading Holofernes (1611-12), oil on canvas, 158.8 × 125.5 cm, National Museum of Capodimonte, Naples. Wikimedia Commons. 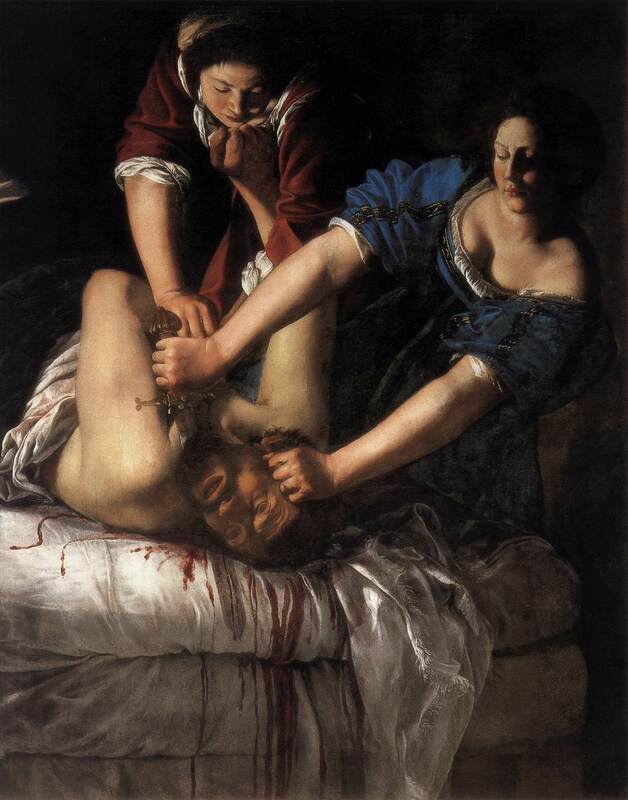 In Artemisia Gentileschi’s famous first painting of Judith Beheading Holofernes (1611-12), she is believed to have made Tassi her model for Holofernes, and herself for the victorious Judith. Artemisia Gentileschi, Allegory of Painting (c 1638-9), oil on canvas, 98.6 x 75.2 cm, The Queen’s Collection, England. Wikimedia Commons. 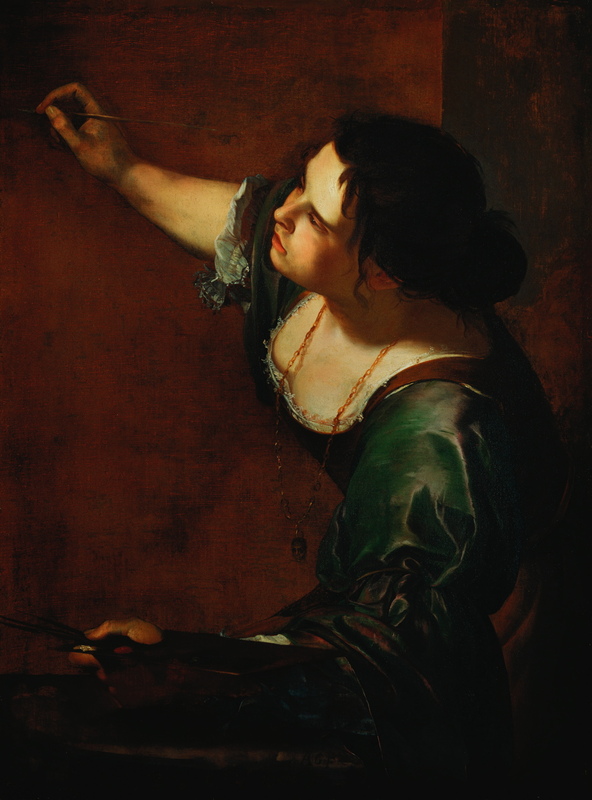 A rather later suspected self-portrait is in her Allegory of Painting (c 1638-9), by which time she had been very successful in Florence, then in Rome, and finally in Naples. It is perhaps artistic justice that her paintings are so brilliant, and so much more widely-known than those of Tassi. We should though know Tassi for one other very important twist of fate. 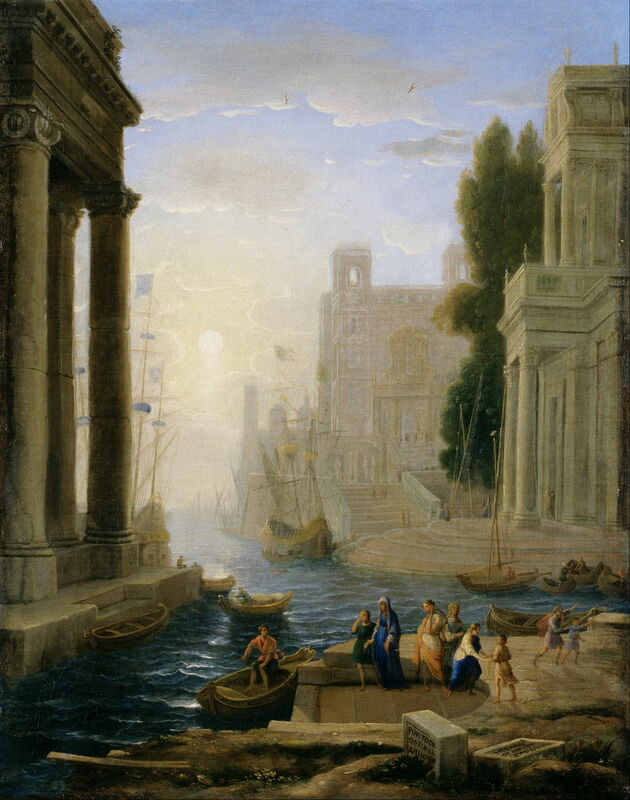 Claude Lorrain (1604/5–1682), whose original family name was Gellée, travelled to Italy in his early teens (he may have been orphaned, although there is dispute over that), and ended up being employed in Tassi’s household as a servant and cook. During his employment with Tassi, the artist taught Claude to draw and then paint, and moved him from the kitchen to work in his busy workshop, which was then very active making frescoes in palaces. Altogether, Claude was probably working there between about 1622-25. After further training, perhaps back in the Vosges (then part of the Duchy of Lorraine), Claude returned to Rome to paint in his own right in about 1626 or 1627 – just after the death there of Paul Bril. 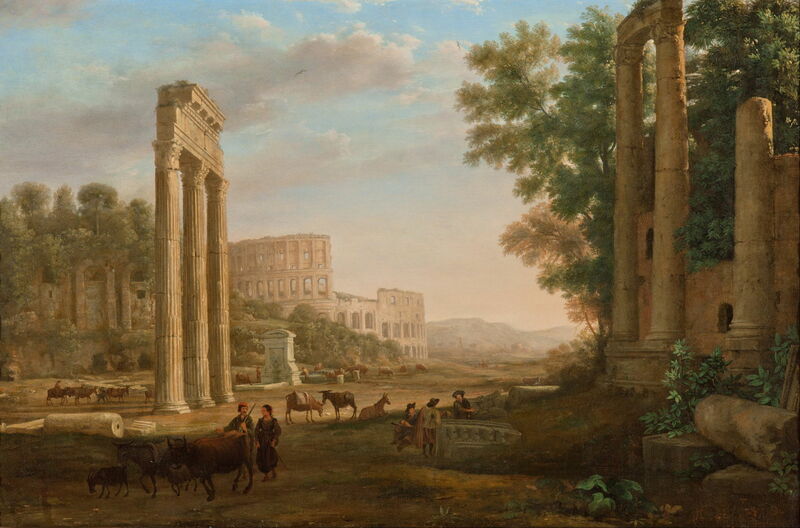 One of Claude’s early paintings shows an almost uncanny link with Bril: Capriccio with Ruins of the Roman Forum from about 1634). Compare that with Bril’s View of the Roman Forum from over thirty years earlier. 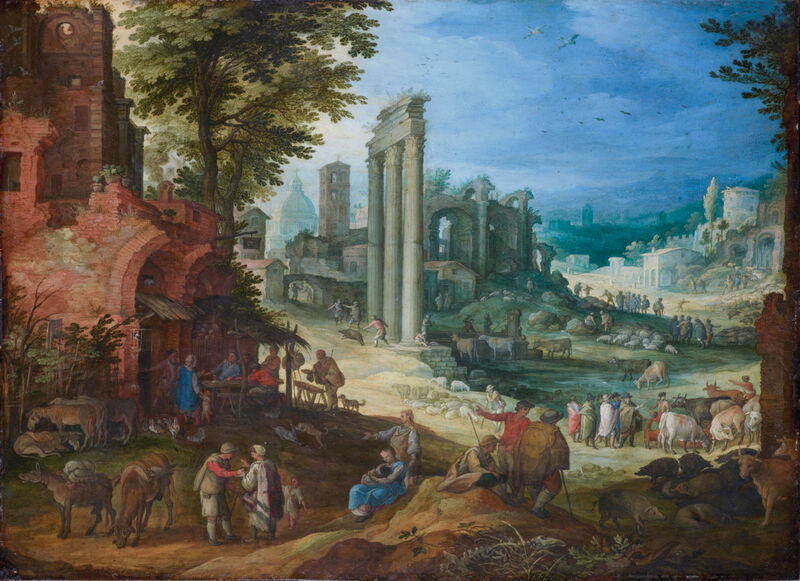 Paul Bril (c 1553/4–1626), View of the Roman Forum (1600), dimensions not known, Gemäldegalerie Alte Meister, Staatliche Kunstsammlungen Dresden, Germany. Wikimedia Commons. 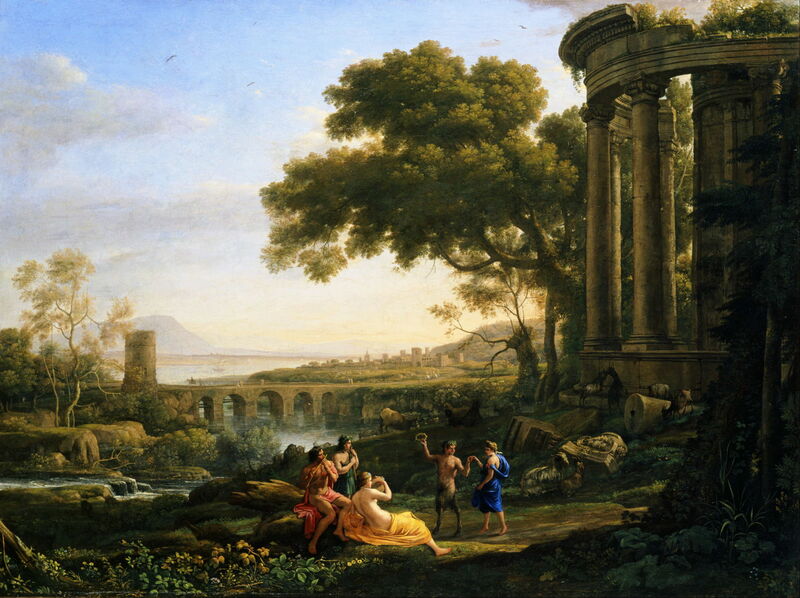 By the end of the 1630s, Claude’s reputation was made as one of the two greatest landscape painters of the period, alongside the other Frenchman in Rome, Nicolas Poussin. Like Poussin, Claude drew and sketched in front of the motif, a practice he showed in An Artist Studying from Nature (1639). Claude Lorrain (1604/5–1682), Landscape with Nymph and Satyr Dancing (1641), oil on canvas, 99.7 x 133 cm, Toledo Museum of Art, Toledo, OH. Wikimedia Commons. Of course paintings like his Landscape with Nymph and Satyr Dancing (1641) were not made outdoors, but assembled from his library of sketches which were. Claude does seem to have tipped his hat in the direction of Tassi in his maritime paintings, such as the Embarkation of St Paula. 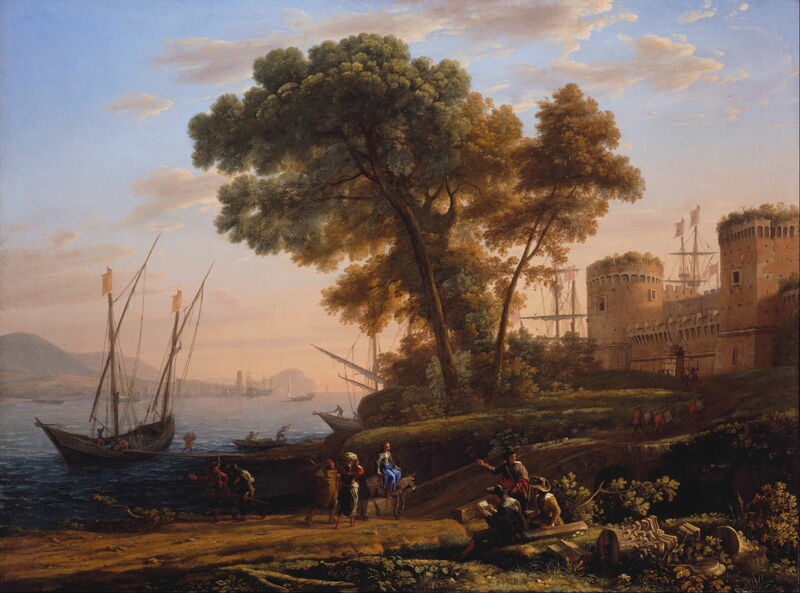 Claude Lorrain’s long and brilliant career came to an end when he died, in Rome, in 1682. He and Poussin had changed European painting, and started the long journey that was to lead next to painting in oils en plein air, and eventually to Impressionism, some two centuries later. That journey depended on the northern revolution in landscape painting, Paul Bril, even Agostino Tassi, and the city of Rome. Posted in General, Life, Painting and tagged Bril, Claude, Gentileschi, landscape, painting, Tassi. Bookmark the permalink.